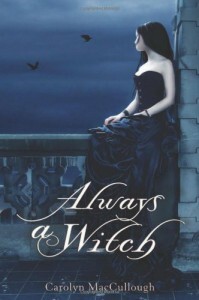 I very recently read Once A Witch, the first book in this series and really enjoyed it! Tamsin is a breath of fresh air and I really connected to her. She struggles with not fitting in her family, being the only one who doesn't have a Talent. Or doesn't seem to have one as we discover in the book. But let's not get spoilery. I was so glad I had Always A Witch waiting on me when I finished Once A Witch, cause I was really looking forward to finding out how Tamsin would fix everything and save her family. A lot of things are cleared up in this book, including why Tamsin's grandmother never told her she did have a Talent and it's a really good explanation! I was really glad of this, because it irks me when things get kept from the main character that are really important for no good reason. But here: VERY good reason. I really loved Gabriel in Once A Witch and though he's not in the story as much as I would have liked, I loved him in the scenes he was in. He's a wonderful character, slightly overconfident, but it's endearing. And as the summary says: Tamsin has a terrible choice to make and seriously, it's awful. I don't know if I could have done what Tamsin did, but for her it was totally in character and I loved her for it. I hope there will be another book with Tamsin and Gabriel, but I fear that it's only a two-book series. It was wonderful and this was a great conclusion to the story started in book one, if you like witches, I'd highly recommended these books!